You will want an anger management class that will be accepted! An 8, 10 or 12 hour anger management class that you can stop and start anytime you want - on your time schedule! This Anger Management Class is completely self-paced, sign out and come back later, the computer will take you back to where you ended. That's right, work on your anger management class a half hour at a time, more sometimes, less others - you choose. This is a 100% completely online anger management class that is 100% self-paced. Our anger management class is offered by the reputable Offender Solutions® series of online classes and was developed by experts. Our anger management class is an 8, 10 or 12 program and can be taken on your timelines in the comfort of your own home. 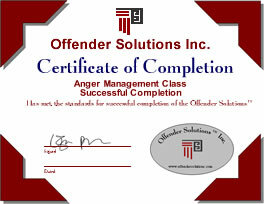 Or, instead of taking the online anger management class, take the anger management class by mail with our workbook. class. $64 for the 8 hr anger management class. $74 for the 10 hr anger management class. $84 for the 12 hr anger management class. Or, our anger Correspondence Workbook course costs $94. Take either the online anger management class or the workbook anger management class - not both. Pay with VISA or PayPal after you register or mail us a check. For a variety of reasons, many people can not attend in-person anger management classes, or cannot find an anger management class that is located in their area. In many cases, an online anger management class makes sense. * Fellow Member of American Association of Anger Management Providers. * National Anger Management Association Member. Our Online Anger Management Class was developed by Master's level experts with over 17 years of real world experience and is based on The Psychology of Anger. Each chapter is activated upon completion of the previous one. Once the last chapter has been completed the Certificate of Completion is activated and available for you. Or, if you want an embossed Certificate to verify your online anger management class completion, no problem, no charge- just ask! Be careful, others charge a Certificate embossing fee and/0r a "Report" fee. We have no added fees. Copyright © 2019 anger-management.com by Offender Solutions® Inc.